In photographs and mixed media works that incorporate painting, sculpture and installation, Micaela Amato reflects on conditions of exile and migration, and the ways in which identity can be affected by relationships to numerous locations. Amato is descended from Sephardic Jews in Spain who fled to Turkey and Rhodes in the fifteenth century, and in dialogue with this ancestry she often incorporates Spanish and Mediterranean imagery into her work. Amato's large-scale cibachrome Ambrasz's Barcelona (2001) belongs to a set of composite photographs made with analog processes that deal with subjects of architecture and the landscape. In these works, contemporary figures are superimposed onto historical or ancient sites, so that, as Amato describes, "boundaries between body and nation, absence and presence are continuously renegotiated and redefined." This particular image depicts two men looking out over an urban scene where buildings are being demolished, while on either side of them geometric structures of steel and glass rise out of the ground. The implied protagonist is architect Emilio Ambasz, whose own emigrations and design philosophy resonate with Amato's themes. 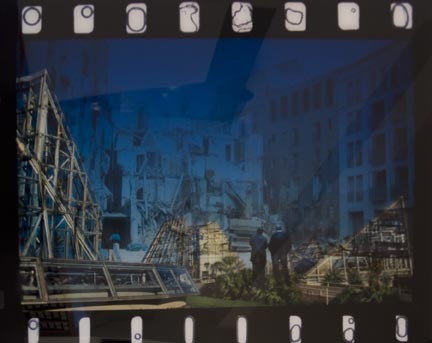 The composite image juxtaposes fragments of the architect's high-tech botantic conservatory in San Antonio, Texas, and the city of Barcelona, depicted during its reconstruction in the early 1990s. Amato completed a BFA at Boston University in 1968, and an MFA at the University of Colorado in 1973. She is a professor of art at the Pennsylvania State University.